I've not seen all that many pairs of Irregular Choice's latest offerings which have appealed to me. I have to admit, the unicorns which everyone seemed to be going crazy for lately are just not my cup of tea. Also, whilst I still like a lot of their designs, I've found that the heel heights have been getting lower over recent years, which is not a winner for me. These Kim Bow heels, however, have not been a disappointment. I seem to be drawn to texture more than anything else, lately and these heels combine a number of them. Velvet bows, embroidered flower trims and the mix of the metallic leather and the floral fabric all sound as though they'd be too much, and yet they all seem to work together in perfect harmony on these heels. Well, I think so anyway. I'm not loving the lower heels. So yummy. I love these! These are beautiful! You are so lucky you can wear heels. A botched knee means its under 2" heel or flats for me. 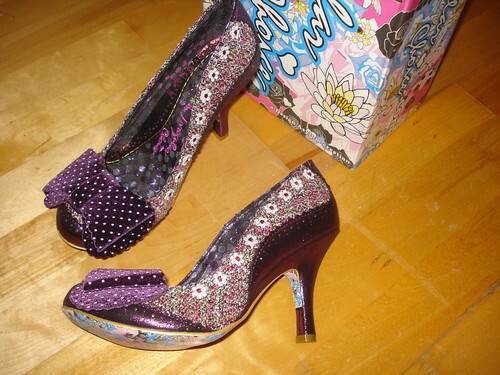 I'm not loving the unicorn and cat heels that Irregular Choice have put out, either. I really don't like the unicorns, they look a bit weird, like a melted candle or something. 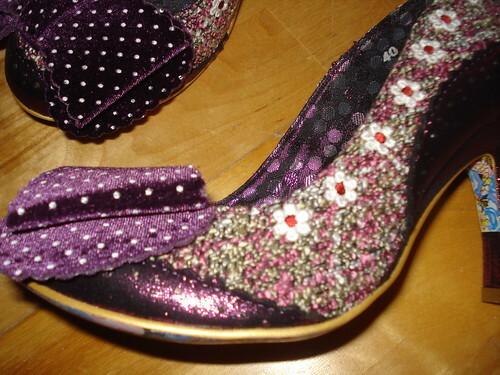 They are lovely, the colour, design and even a bit of sparkle. Winner. I'm all about the high heels, but at least my bank balance is happier, the less shoes I buy!